Richard Nonas, Untitled, 2012, steel, 8 x 9 x 4”. Since the late-1960s, and with poetic simplicity and an economy of means, Richard Nonas has embraced “locally grown” materials (wood, steel, and stone) to make sense of found space. For “Ridge,” his first solo exhibition with James Fuentes, Nonas aligned his steel floor piece Long Division, 2013, with the entrance of the gallery, as if to immediately pull us into the work. Three untitled works similarly reside on the floor; made of sawn-off steel lengths, they resemble scratched and pitted building blocks, and are the show’s mathematical remainders set within the room’s topography. One sculpture meets the gallery’s white wall in an inverted L-shape, held in place by nothing but gravity. Nonas also employs split logs hewn from downed trees, such as a pin oak post–Hurricane Sandy or a cherry tree after an earlier storm. He combines the pieces using a wooden-peg construction and installs a sequence of the ad hoc assemblages at eye level on the surrounding walls. In an evocative way, he places the lengths of wood alongside or on top of one another in an arrangement that imbues them with an aura of presence. 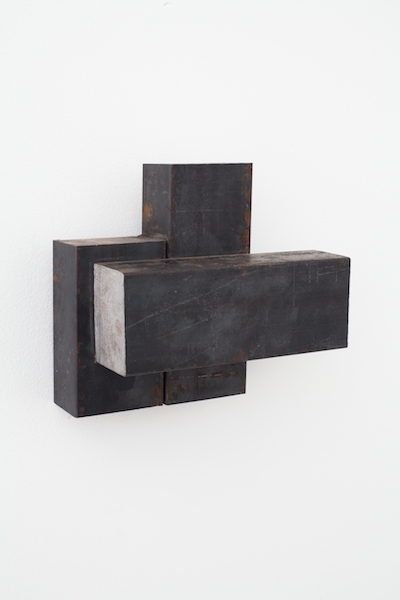 Untitled, 2013, which is composed of three steel rectangles stacked together, hangs heavy in between the otherwise buoyant works made of wood. Levity and weight are visibly constructed in this elegant show of polar materials that each simultaneously assert the feeling of grounding and dissonance. The complexity of such a transition is at the heart of this work. Nonas asserts, “The most useful moments are the moments of confusion.” His sculptures ultimately become markers for our comprehension of these momentarily invisible lacunae.